The very first parking meter started nickel-and-diming citizens on a hot, muggy morning at the corner of First Street and Robinson Avenue in Oklahoma City on July 16, 1935. Every since that day the hungry little machines have been taking our nickels, dimes and quarters in ever increasing numbers. The lack of that small change or the failure to return and Feed the Meter has spawned billions of dollars for city and county coffers over the last 78 years. 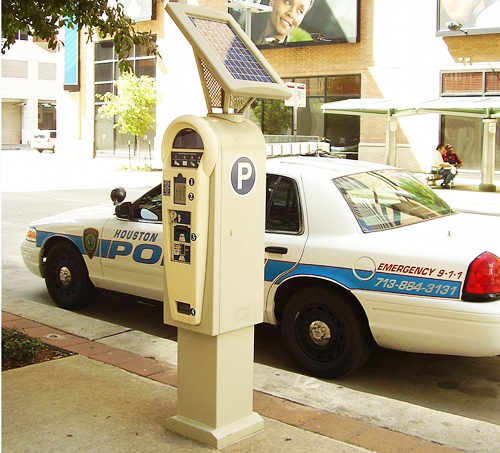 The proliferation of parking meters, generally limiting occupancy from 1 to 4 hours, to the supposed benefit of retailers and their customers, directly resulted in the parking lot and building business – where cars could be parked for longer periods for an even higher fee. The parking industry now involves over 13,000 firms collecting some $8 billion annually. Many have experienced the trauma of having to be somewhere and lacking the proper change or simply forgetting to return to add more money to the little bugger when at lunch or dinner or some appointment. The lack of 25¢ could cost you $25 for a meter violation 30 years ago – we don’t even want to know what it amounts to today. Of course, not having the funds today is less likely – as modern parking meters will take coins, bills, debit and credit cards, and the price of urban parking keeps going up. So, if you’ve a vested interest in the parking industry perhaps you’ll break out the Dom Pérignon. The rest of us will raise a toast and mutter a minor curse on behalf of the parking meter’s birthday – the armless bandits that brazenly stand at attention, all along the urban streets of America, as a simple fact of life. Just give them a few months and the cities will probably be selling prepaid parking cards to use in the meters. Why wait to collect funds when they can and probably will be paid in advance?